The sailing policy committee suggests the following sailing procedures for the weekly (Wed/Sat) fleet and handicap races. Any changes in the rules must be approved by the Board, and will become effective the start of the following season. The Commodore's Newsletter will contain all changes and will constitute the required "posting." The only boats eligible to count in a regular LYC race must have a skipper whose annual dues are currently paid in full. Series Races: short course on Wednesday and Saturday afternoon, with possible exceptions determined by the Commodore. These races will be for fleets approved and recognized by the Commodore. Coast Guard rules for life jackets shall apply. The postponement or cancellation of a race will be done by the starting committee with the fleet captains involved. Acknowledged rule infringement may be wiped out by doing a 360 in a series race or a 720 in a handicap race. Fleets may score as they choose. However, the Handicap Cup will be awarded on a percentage basis. Three boats regardless of class must start to qualify a handicap race. 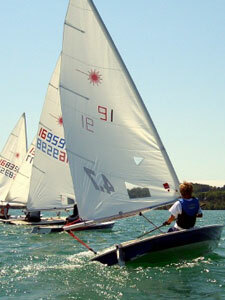 Three boats of a given class must start to qualify the respective fleet race. Here's a link to the rules page. Here's a link to the .pdf of the rulebook.